Former U.S. President Bill Clinton may have gotten top billing for Samsung's keynote address at CES 2013, but the South Korean company didn't skimp on offering up some innovation news in the form of flexible OLED smartphone displays. Stephen Woo, president of Samsung, was joined by Brian Berkeley, senior vice president of Samsung Display, to show off the new screen tech. Called "Youm," the bendable OLED lineup uses thin plastic instead of glass, turning the display into pliable and almost unbreakable screen. Berkeley showed off a curvaceous prototype, one with wrap-around screen that took the display, including any content on it, around the edges of the device. 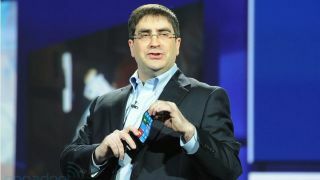 Microsoft CTO Eric Rudder later hopped onstage as well to show off a prototype Windows Phone with the flexible tech, one that bent into a wavy strip and demoing, in Woo's words, the possibilities for Samsung partners to create screens with shapes completely up to users' whims. Putting a name to its display tech is certainly a step in the right direction for Samsung in bringing this pliable brand of OLED screens to consumers. While we don't expect the screen to show up on public-ready phones soon, it's something Samsung wants to keep on the radar so that when the time does come, we'll be ready for it. The company also announced that it's developing a 10.1-inch LCD panel that will use 25 percent less energy than the current iteration without sacrificing any of the resolution. We'll provide more follow-up on that development as soon as it becomes available.